On a recent Monday afternoon, I walked in on some frisky action at the café Boris & Horton. “I have to leash Horton now because he’s breaking the house rules,” jokes owner Logan Mikhly about her eight-year-old dog’s less than, uh, gentlemanly behavior toward a larger friend (some of the house rules are helpfully posted: mind the hormones and keep it classy). 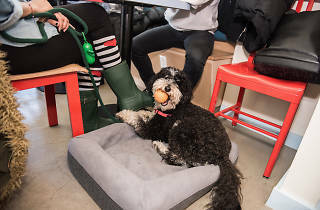 Once Mikhly leashes the scruffy Chihuahua mix, the pooch patiently sits by the shop’s pup-sized GIF photo booth and listens as Mikhly talks about opening the city’s first official dog-friendly café with her dad, Coppy Holzman. The Alphabet City newcomer is a feat of both canine and NYC licensing logistics. It has two parts that are Department of Health-approved: the sunny, humans-only side that could be a standalone café, where you pick up your coffee and hang out at a table (if you don’t want to abandon your furry pal outside, try the outdoor takeaway counter); and the dog-friendly side, where the humans can drink their just-bought coffee and sit with their four-legged friends at one of five tables. A cutesy shop inside also sells doggie-related clothing, knickknacks and pastries (Red-Velvet Pupcakes and Turmeric Bunny Peep Cake, among others). Even though Boris & Horton has been open for only two months, 28-year-old Mikhly has plenty of stories to tell: the time a fan in Mexico sent her handmade Horton and Boris (Holzman’s two-year-old pitbull-mix rescue) figurines, now displayed by the cash register; or when a regular crocheted Horton a green bandana (which he sports with aplomb); or the boy who divided up just-purchased dog pastries among the grateful dogs like feeding pigeons in a park. Due to its close proximity to dog owners and dog lovers, Mikhly says the café has quickly turned into a neighborhood spot full of enthusiastic regulars, like a New Jersey woman who emails to find out if there’s room that day for her 130-pound mastiff mix. Weeknight events with rescue organizations like Bideawee and Badass Brooklyn Animal Rescue (bingo with older dogs, anyone?) also foster a sense of canine-centric community. 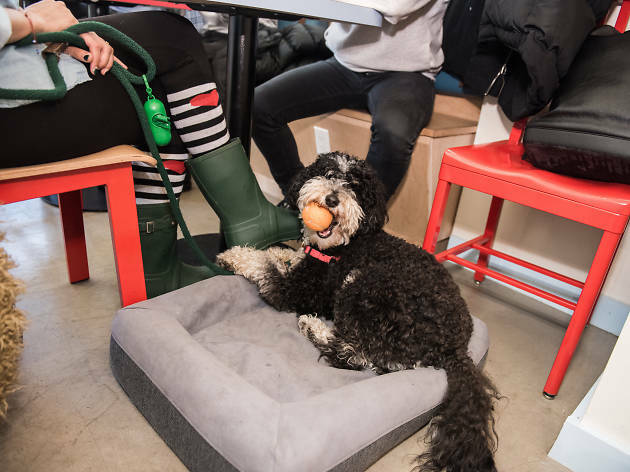 It can get super pup-packed on weekends, so Mikhly and Holzman are already thinking about opening other shops, potentially on Manhattan’s West Side and throughout the city (Mikhly lives in Williamsburg, and her dad lives in Greenwich Village). Amid all the fluffy cuteness, it’s easy to forget that B&H is actually a legitimate café. Mikhly and Holzman worked with Bushwick-based City of Saints to create coffee blends (the Boris has notes of “dark chocolate and roasted marshmallows”) and seasonal beverages, including the Horton, a latte with house-made cinnamon-spiced mocha syrup, and the Eloise, a latte with maple syrup and sea-salt flakes (delicious). The all-vegetarian menu includes elevated twists on café bites, like labna-banana toast and raspberry-Muenster danish. They even serve cans of beer and glasses of wine at night. As I’m leaving the dog side of the café, a first-time customer introduces herself and her dog, Bolt, to a staffer, who greets them like a teacher would greet a parent with her shy kindergartner on his first day of school. And aside from one pup who barked once before its owner gave him a quick tug, the other dogs stood alert, eagerly waiting to welcome their new friend to the pack.